Title: With film, sometimes you get burned! Description: Sometimes you found out later that a cool shot was blown due to film problems or processing! Here, former PC U25C 6501 led sister unit 6505, U25B 2629, and brand new C30-7 6608 out of Selkirk yard in December, 1977. 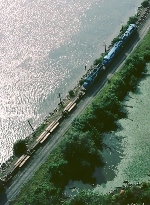 Description: A solid blue consist heads down thru the curve. Description: Sequence 1 of 3. Description: Sequence 2 of 3. Description: Sequence 3 of 3. Description: Trailvan and auto rack trains typically got helpers on the head end, due to the train handling tendencies of the long cars, especially on the many curves. Today an EL SD45-2 does the honors. Description: The auto rack train has passes the park and is now working out of the curve. Note the open racks, nonexistent today. Description: TV-80 rolls south on the River Line toward North Bergen. Ahead is West Point and then Bear Mountain. Description: NHSE's power gets "tagged" for helper duty, assisting SEPW up the west slope of Washington Hill. Title: CONRAIL POOL POWER VISITS UTAH. Description: Union Pacific's OGVIT heads east on main no.3 (UP's ORIGINAL PROVO-SALT LAKE CITY MAINLINE),With iron ore empties. This track between Provo and Lakota Junction has since been torn out to make way for Utah Transit Authority's front runner project. Just one year from this date Conrail too will disappear and will be split up between Norflok Southern and CSX.